Looking for DAB Radio in your car? Do you listen to Digital Radio at home? DAB allows you to continue to enjoy that experience in any car – from Absolute 80s to XFM via BBC 6 Music and Planet Rock – Enjoy your journey. DAB is the complete and universal way to start listening to crystal clear digital radio in your car today. Designed, tested and sold by DAB, our product is an affordable way to upgrade to digital radio. Using RDS technology all station and track information is shown on the original stereo’s display. Our patented AFC technology delivers seamless digital radio with no interference on your travels. From the antenna to the remote, everything is included for the complete universal solution. Listen to digital radio at home? Continue the experience! The future of radio is digital – upgrade your car now! 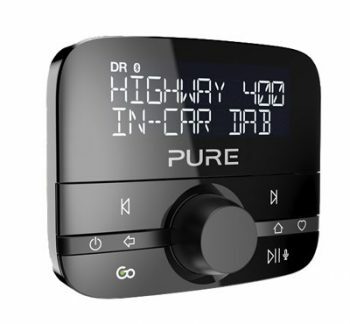 Highway 400 – In-car audio adapter with DAB and Bluetooth music. The easiest way to enjoy DAB digital radio and Bluetooth music streaming from your mobile in your car, this clever audio adapter is simple to fit and works seamlessly with your existing in-car audio system. Contact Us today to discuss options for fitting a DAB Radio into your car.